The table is constructed of rustic hewn "logs" and finished in an aged stain. 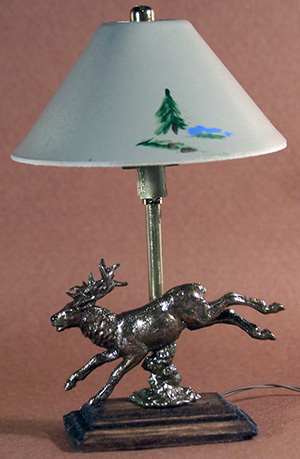 It measures about 2&1/2 inches tall, 4 inches long and 2 inches wide. 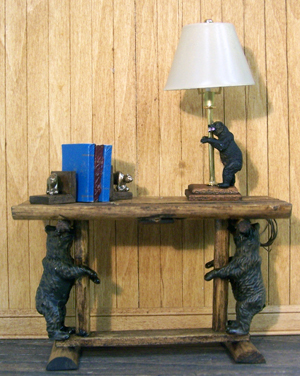 The two black bears supporting the table top add a touch of whimsey. Pile on stacks of magazines, books or games and you are set to while away the hours when winter keeps one inside. Add a matching bench, floor or table lamp to complete a cosy and unique addition to the cabin setting. Ask about special pricing when three or more Bear Creek pieces are purchased together.